Moderate with areas of significant elevation. I did not come across much information on-line about this hike, but it is by far one of the best kept secrets in Rhode Island. Starting at a small parking area tucked away between 20 & 24 Connors Farm Road I entered the conservation area. A couple of minutes in I came to the first intersection. 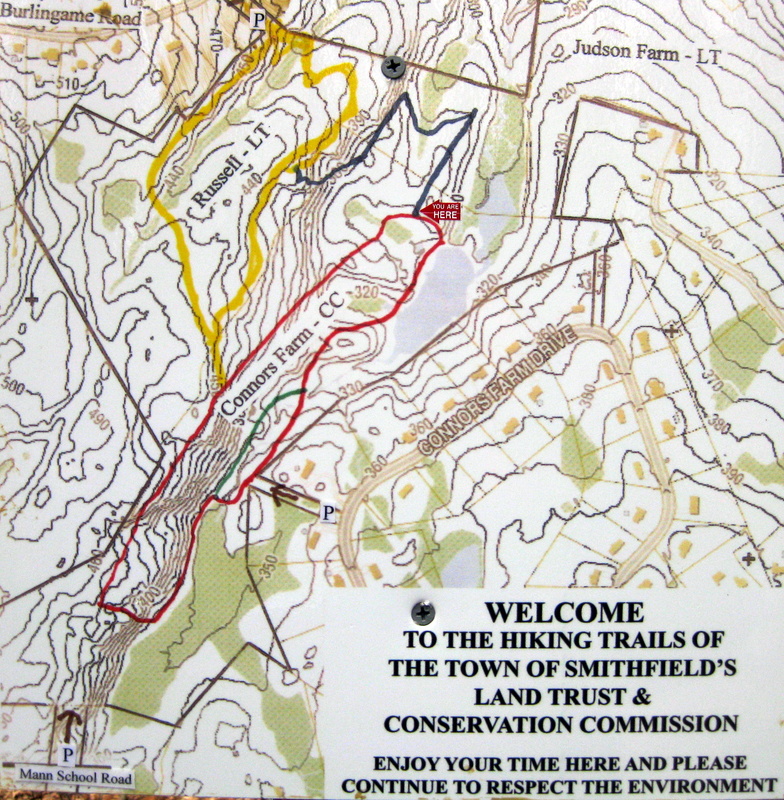 At each intersection there is a trail map with a “You Are Here” tag and the paths are very well marked. At this point I turned right onto the red trail. The red trail crosses a small brook at a wooden bridge then continues along the shore of a small pond that has several birdhouses on poles. Toward the end of the pond there is a spur to the right if you want an unobstructed view of the pond. Continuing back to the red trail I came to the next intersection. Here I opted to follow the blue trail. This trail started at first with a slow ascent going by a spectacularly long stone wall. As it bends around to the left the ascent increases. In this area the blue trail splits. 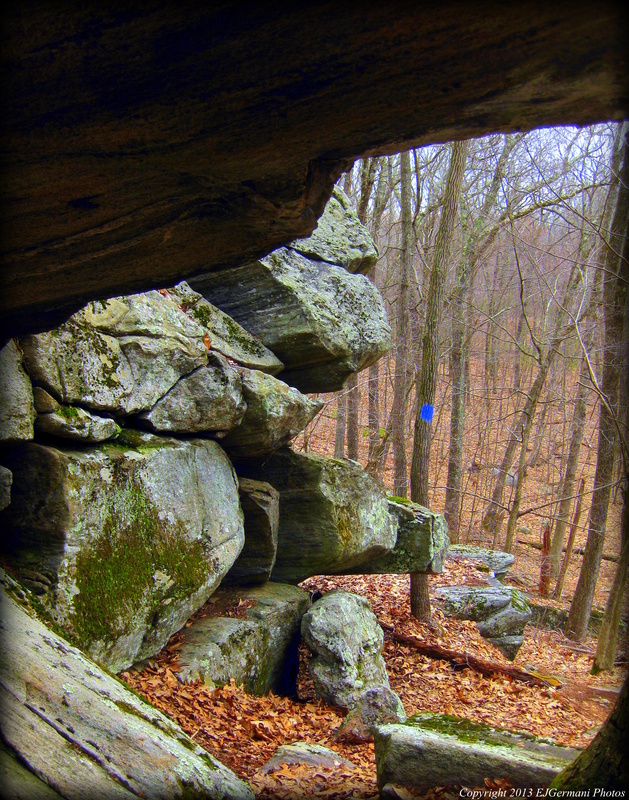 To the left was the “Lower Trail” and to the right was the “Cave Trail” both marked as blue. Curiosity kicked in at this point. Cave Trail it was. This section was a bit of a workout as the incline increased more. The trail was narrow and ran along the edge of glacier formations with small caves. I actually had thought to myself that this section would be quite dangerous in wet weather. After the caves the “Lower Trail” rejoined the “Cave Trail” and then the blue trail gave one last challenge of ascent before ending at the yellow trail. I then turned left onto the yellow trail. (More distance could be added to this hike by turning right at this point.) I followed the yellow trail as it winded through the woods until its end at the red trail. Take some time here. The views are spectacular and you get an idea of how much elevation you have climbed so far. Don’t get too close to the edge though. After a short sightseeing break I then proceeded to the right and followed the red trail around a loop to the left, past a wild cranberry bog on the right (I will be back in the fall to check that out), large boulders and outcrops to the left, down to a stone bridge which crosses the stream, and then just a little further to the entrance path on the right. So far, one of the best hikes this year! I could not find a trail map on-line. See below, I took a picture of one.